Big moments decide big games, and in the closing stages of yet another enthralling Test in Australia, Ireland ultimately managed to come up with more than the Wallabies did. It was a remarkable defensive effort from a team who looked out on their feet after what has been a gruelling season, yet their character is such that they were able to dig deep enough to get the job done. Time and time again, Australia asked questions of the Irish defence. On the rare occasion that they managed to punch a hole through the green wall, there was invariably another man on hand to bail his teammates out. Of all the big defensive moments that they enjoyed, few summed up Ireland's sheer desire to win more than Keith Earls and Bundee Aki's counter ruck on Reece Hodge. With 10 minutes left, Kurtley Beale intercepts Johnny Sexton's pass before Jacob Stockdale reacts well to make the cover tackle on Joe Powell. 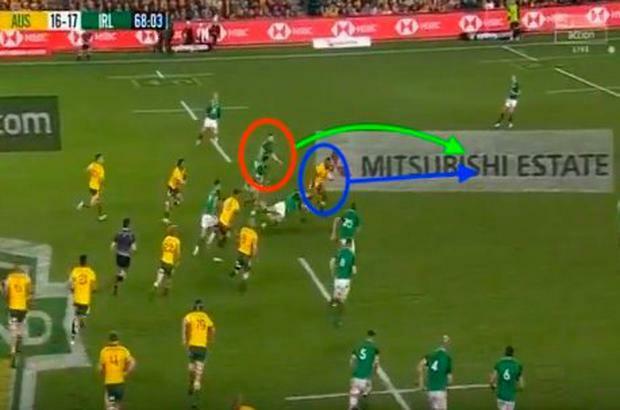 Australia's transition from defence into attack is outstanding and they immediately recognise that Ireland are short on their right wing. In image one, Earls has just made a good hit on Hodge, with the help of Aki. Not content with just making the tackle however, Earls (red circle) quickly gets back to his feet and drives over the ball. Aki (blue) adds his considerable bulk, as does James Ryan a couple of seconds later. Ireland have now gone from what looked like a dangerous situation to forcing a vital turnover that lifted both the Irish players and the sizeable support in the crowd. Apart from the number of first-choice players that Ireland were missing, what made this victory all the more impressive is that they weren't at their best. They never quite hit full throttle, but like all good teams, they found a way. Robbie Henshaw will have been the first to put his hand up after the first Test, when he was caught out a couple of times defensively. Restored to his more familiar inside centre for the win in Melbourne, Henshaw was back in the No 13 jersey on Saturday, and it was clear that the Athlone native wanted to prove a point. Alongside Aki, the former Connacht teammates were excellent. Garry Ringrose may be the first choice outside centre going forward, but Aki and Henshaw is a quality partnership to fall back on. Between the pair, they made 23 tackles and 17 carries. Like Ringrose, Henshaw's ability to problem solve makes him stand out from the rest and he came to Ireland's rescue on more than one occasion. The 25-year-old is a hugely intelligent player and his ability to read the game is outstanding. He may have been caught out in the first Test, but he wasn't going to make the same mistake twice as he got rid of what was understandable rustiness. In image two, we can again see the Wallabies looking to do damage out wide again. Earls finds himself outnumbered and rushes up in an attempt to cut out Bernard Foley's pass. But the Australian out-half plays a lovely floating pass to Dane Haylett-Petty (blue), who is going to run a straight line along the touchline. Henshaw's (red) awareness is vital as he recognises the danger. Haylett-Petty steps around Jordan Larmour who is covering the back-field and just as it looks like the Aussie winger will run clear to score, Henshaw times his arching run to perfection as he hauls Haylett-Petty to the ground. 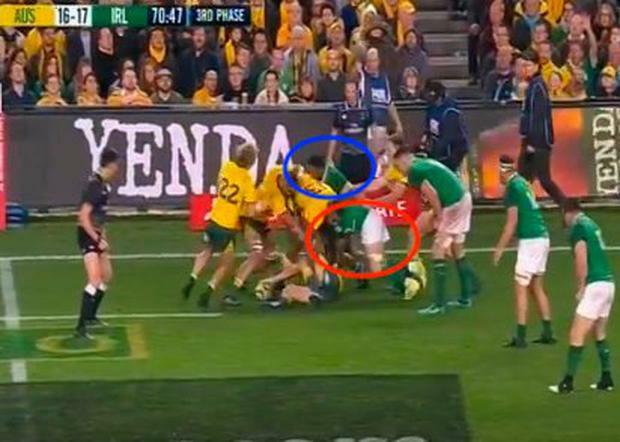 Eleven minutes later, as image three illustrates, Ireland are potentially in trouble again - this time when Samu Kerevi (blue) goes through Sexton. 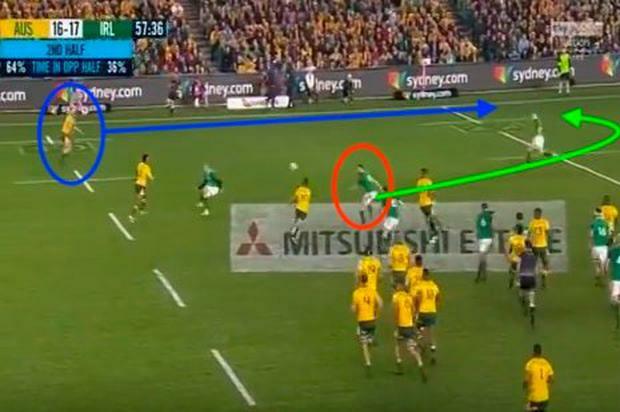 Henshaw's (red) body position is excellent and the speed with which he reacts to the threat to take Kerevi down buys his team vital seconds before Australia make the error. After a long and successful season, it would have been easy to throw in the towel, but the character of this Ireland team is unquestionable. And that is one of the main reasons why they are the dominant force in the northern hemisphere right now.